As long as you are paying even minimal attention to your garden and the passage of the seasons, plants that self-sow and spread from the roots won’t be able to take over, and those that would die without refuge from winter’s worst can be kept alive for years instead. Self-sowers and spreaders fill the gaps between established perennials and shrubs in my garden. 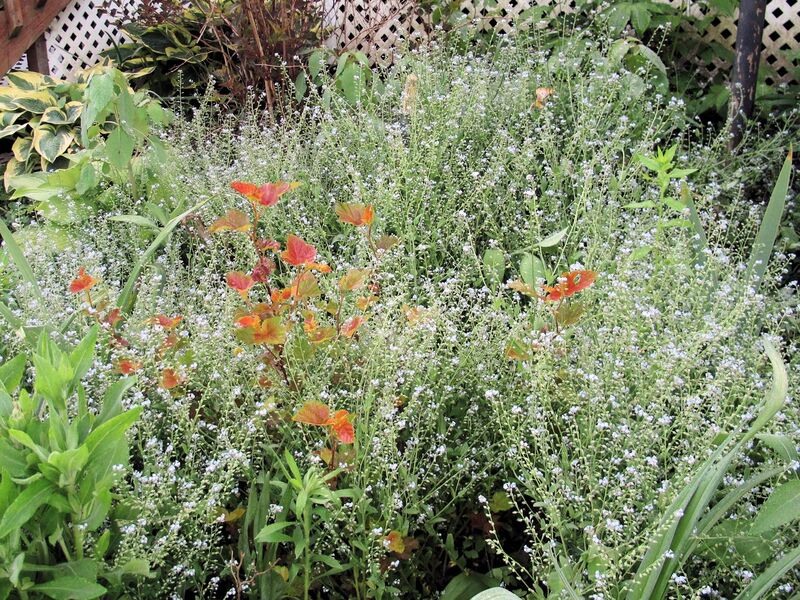 They take up space that would otherwise be occupied by weeds, and they lend an unstudied air to the garden. As Kristin explains, because these plants are so inexpensive (a packet of seed the first year, and after that, they just show up), it frees you up to be more spontaneous in your garden’s design–editing and moving plants around in response to their growth and change. It can be scary to loosen your sense of control, because these are the plants that know how to propagate themselves. They are just this side of being weeds, and you have to get used to pulling them up like weeds (except we call it editing, not weeding) if you find plants are too crowded or are escaping their boundaries. But it can also be exhilarating, allowing yourself to loosen up and experiment instead of coloring inside the lines of your carefully drawn up garden plan. Kristin introduces you to many propagation techniques that enable cold climate gardeners to have a more plentiful garden. We can grow more unusual plants when we grow them from seed, we can have more of the plants we love by rooting cuttings, and we can introduce more tropical plants inexpensively by wintering them over from year to year. 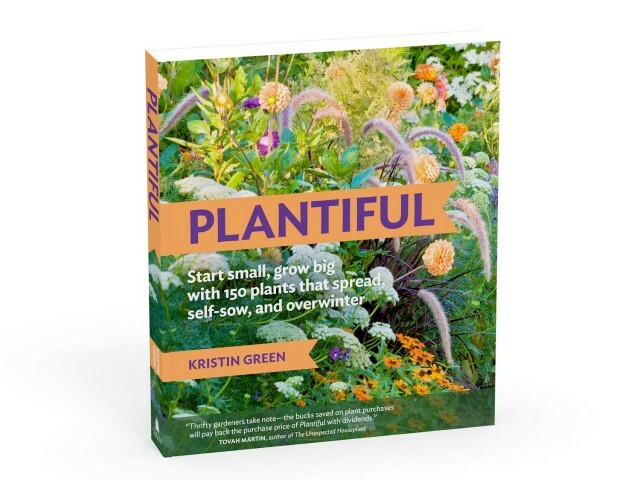 Better yet, Kristin’s book is a treat to read, with a frank and playful style that makes you feel like you’re learning a friend’s best gardening secrets. If you regard gardening as an artistic endeavor and want to broaden your palette and strengthen your skills, you need this book. If you want to be thrifty and resourceful in the garden, you need this book. At the end of this post, I’ll be giving away one copy, but right now I want to show you some of the ways I use self-sowers in my own garden. 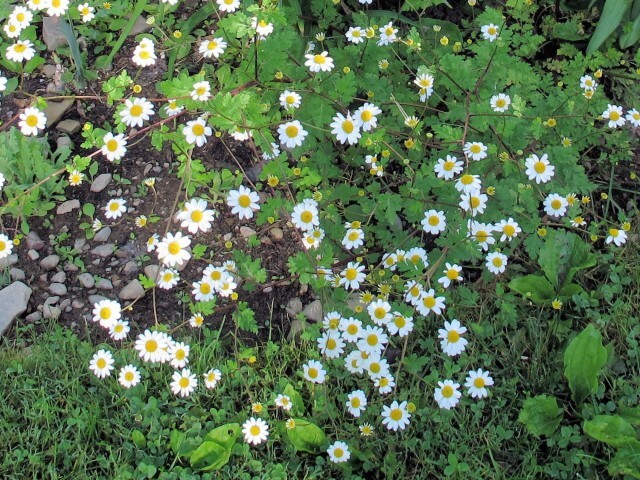 Feverfew daisies have a nice airy feel. They self sow rather moderately and don’t take up much space. There is also a double feverfew whose flowers look almost like pom-poms, and a golden feverfew whose foliage glows but seems harder for me to keep going. Forget-me-nots (Myosotis sylvatica) attempting to overwhelm a ‘Golden Jubilee’ ninebark. Is there anyone who can resist the true blue of forget-me-nots? Yes. Those who prefer their garden to look neat at all times. These plants have been pulled since the photo was taken, since most of their bloom is over and the earliest flowers on each stem have set seed. If I was really smart, I would have thinned the plants when they were still seedlings, but I didn’t get around to it and the world didn’t end. It just got a little messier. Kristin talks about thinning in her book. 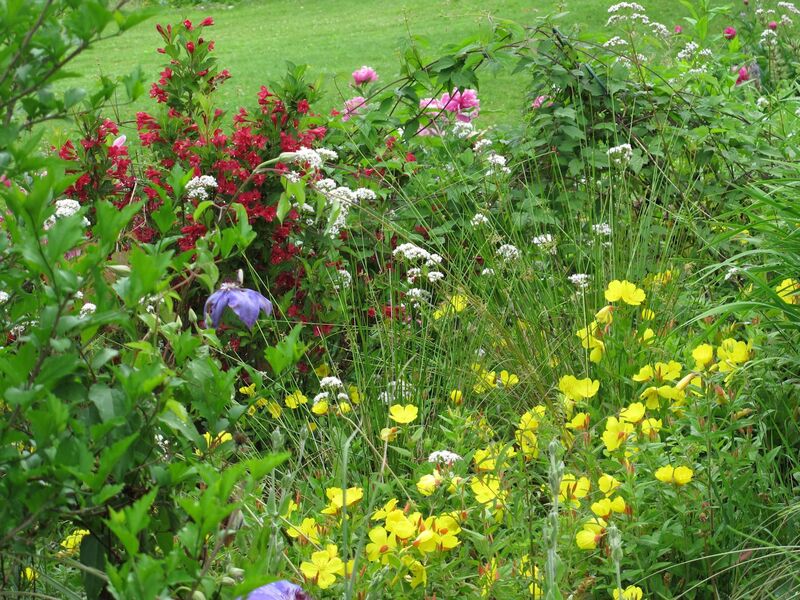 Johnny-jump-ups (Viola cornuta), rose campion (Lychnis coronaria), love-in-a-mist (Nigella damascena), and opium poppies (Papaver somniferum) compete for space in the front border. Johnny-jump-ups are especially good for cold climates because they love cool temps, blooming early in spring and continuing pretty much all summer long, growing taller and depending on the support of other plants, as long as it doesn’t get too hot. Rose campion is a biennial with furry leaves and typically magenta flowers, less commonly white or white with a pink eye. Love-in-a-mist adds another note of blue and an airy texture. It’s another annual that prefers cool climates. Opium poppies can be quite dramatic, especially if thinned as seedlings, and can be deadheaded to extend their bloom. These plants will fill in the gap left by the dying colchicum foliage. Foxgloves are another biennial, blooming the second year and then dying. As long as the first year rosettes are covered with snow they are fine, but I have lost plants in an open winter or a nasty mud season with violent swings in temperature. These petunia seedlings showed up underneath windowboxes in the front, after we had gotten rid of some overgrown foundation shrubs. It helps to be observant and have a good visual memory in order to take advantage of such serendipity. Most people wouldn’t be interested in self-sown petunias because they won’t come true, but I enjoy being surprised. Both of these plants spread by stolons as well as seeds, so they can spread quite a bit. Fortunately, they are both pretty easy to pull out. Garden heliotrope is fragrant and blooms with the later peonies, making a nice filler for a peony bouquet. Sundrops can tolerate a wide range of conditions, so you might want to consider them for a problem area. One clump of lupines was growing in the Slope Garden when we moved in. 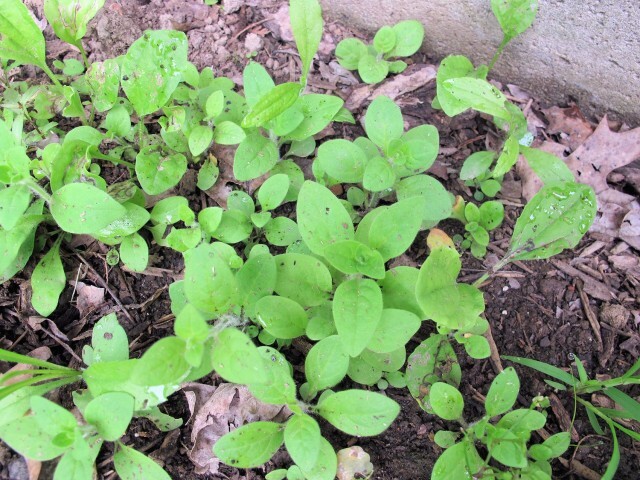 As I have been weeding I have found seedlings which I allowed to grow, and now I have several sizable clumps. Lupines, like the petunias, do not come true from seed, but gradually revert to these purple hues, which I find blend in better with the rest of the bed. If I hadn’t availed myself of these self-sowers, my gardens wouldn’t look nearly as full and lush as they do. I’m looking forward to trying more of the 150 plants that Kristin describes in her book. 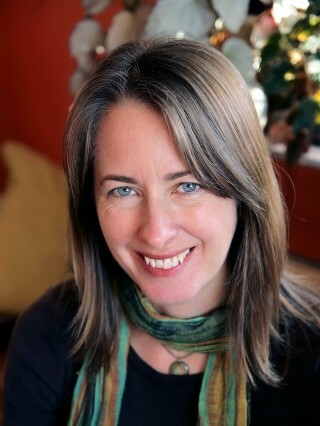 Kristin Green can help you grow a Plantiful garden. 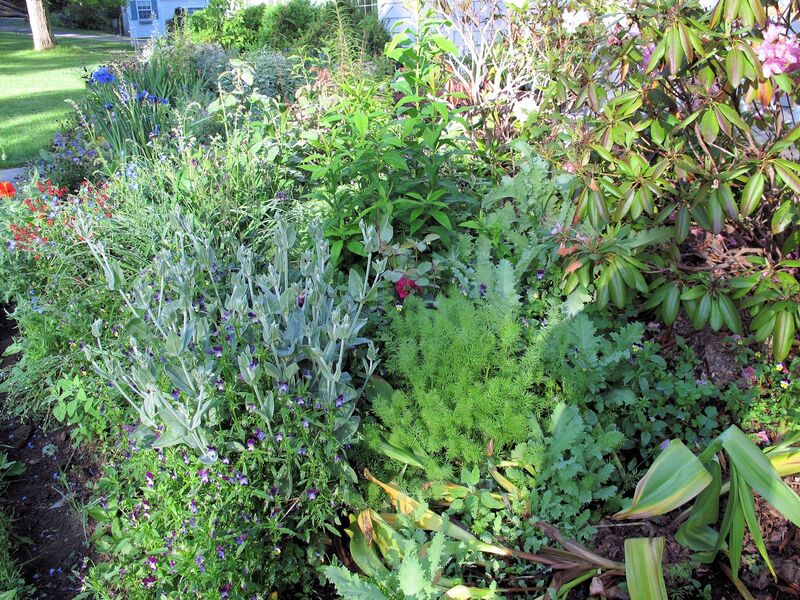 Comment below and tell us your favorite self-sowers, or why you don’t like self-sowers in your garden. Or just mention that your interested in winning a copy. One commenter will be chosen at random to receive a free copy of Plantiful. Winner must provide a valid email address in the comment form. Giveaway will end at midnight Pacific Time on Sunday, July 20, 2014. Timber Press provided a review copy to me and a copy to give away. Links to Amazon are affiliate links. My favorite self-sower is wildflower called Butterfly Weed. Somehow it got in your front garden (it grows wild around here but not anywhere near our front yard) and I make sure to leave a few of them grow. I have been surprised by impatience that self seed. They appear rather late in Spring, however, at this time each summer they fill a corner beside the deck and rear of our house. Each AM when I water the potted plants, I stop to observe them. They always make me smile! Verbena bonairiensis self-sows delightfully, and I look forward to finding the seedlings. A friend gave me a couple of gold-leaf feverfew that have given me lots of babies this year, which I plan to move in early September. I’m counting on Labrador violets to spread under/around shrubs, too. I would love this book. I could wish for self sown petunias. I’ve only had that happen once, in almost 40 years of gardening, and it was fun. Years ago we had johnny jump ups in our lawn but they disappeared a long time ago. On the other hand, want some purple columbines? We have about a zillion of them. My favorite is nigella, because it is so small and good at filling gaps and easy to pull. 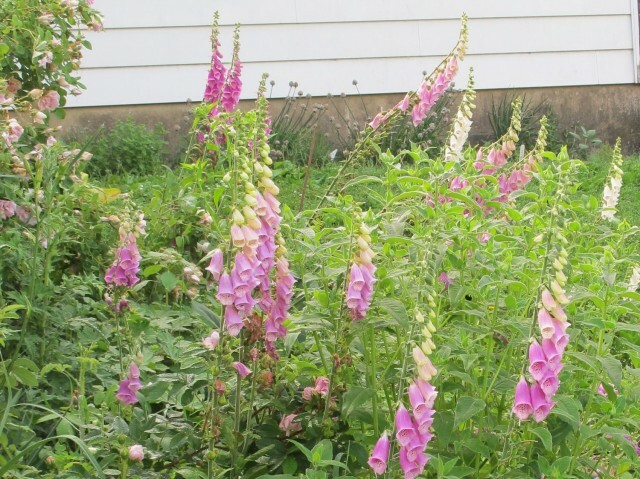 We also have Grecian foxglove,centauria Montana, and blackberry lillies doing their own things, but I find those more of a responsibility to maintain and site well. My favourite self seeders are sweet william. They are abundant enough to make bouquets for the house and provide a pop of colour in lots of spots in the garden. LOVE self sowers – fennel, perovskia sage, basil, catmint, perilla, the list goes on. Would rather pull up starts for someone else’s garden than weeds to go in the trash. Sounds like a great book! I would love to receive this book! I’ve just sown poppy seeds hoping they will fill in my new garden bed, and I’d like to know about other plants that I could use. It’s amazing how long the seed can persist and remain dormant until one season…there are these plants. This has happened for me with flowering tobacco, cleome, datura, and opium poppies. The poppies drive me crazy because they produce so much viable seed (meaning lots to edit). Maybe I’ll try the smaller California poppies. I love love-in-a-mist. This year I’m hoping my portulacas will self-sow. Another favorite is the annual bachelor buttons. They come in a variety of colors too. Another tip: I group my houseplants in big pots with tropicals and everything comes in for the winter. Sure saves on my gardening budget each spring. I purchased one package of picatee cosmos about 10 years ago, and have enjoyed them ever since! It takes will power to edit! Thank you for such a lovely review of this book, and for sharing your personal self-sowing favorites… it’s so much fun to learn from others! My favorite self-sowers this year are my many varieties of basil that popped up on their own — you can never have too much basil around to complement summer tomatoes (another great self-sower). Thank you! Would love to see what else is in the book…I always appreciate self-sowers that keep me from having to buy lots of annuals! I love self-sowers and perennials that can withstand drought and deer infestation! Does she have some of those in her list of 150? I have a hard time pulling out perfectly good plants but like the term editing. Larkspur and 4 o’clock are two of my favorites. This year my favorite self-seeder is Penstemon Dark Towers, which has left babies everywhere in the garden, that quickly grow up to be just as stunning. And I always love Primula japonica, which has hundreds of babies. I think every seed germinates, and they are so easy to move. Euphorbia ‘Chameleon’ and Geranium ‘Espresso’ are wonderful dark-leafed volunteers. 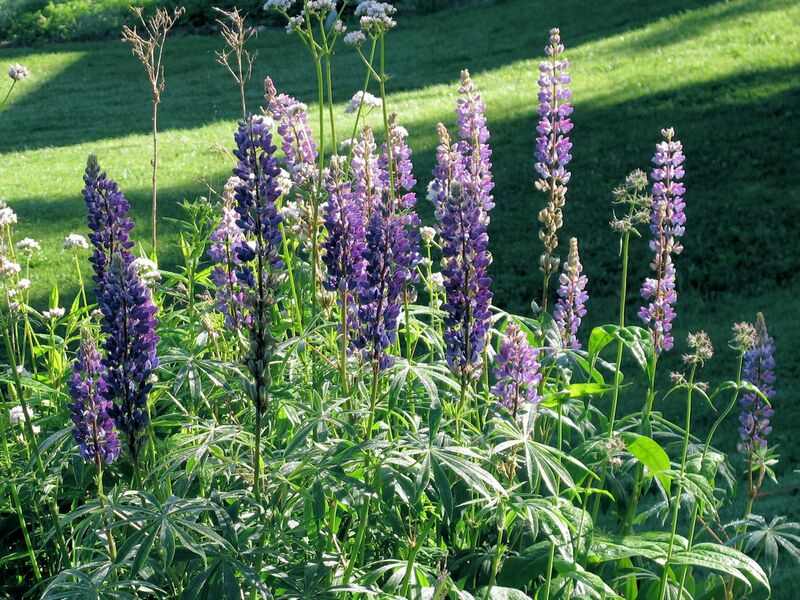 I have many other self-seeders also: johnny jump-up, lupines, foxglove, great blue lobelia, nigella, columbines, golden feverfew, sea holly, agastache Golden Jubilee, Ravenswing cow parsley, Cryptotaenia japonica ‘Atropurpurea’ (AKA Japanese parsley), amsonia, lady’s mantle, etc. One I have yet to successfully establish is corydalis lutea. I long for it to settle in and seed around, but it never comes back for me. California poppies are tying my new garden beds together beautifully this year. I started out with a both Thai Silk and Bridal Bouquet varieties and they have hybridized wonderfully, I have colors I can’t believe and they have self sown some amazing combinations amidst the perennials. I love the blue clouds of forget-me-nots in May. When they finish, I pull the spent plants out and pile them on any new beds I’m making. This year I was slow to remove them and I found I even loved the look of the spent plants from a distance – they made a sort of reddish haze that was quite pretty. Another self-sower in my garden is Verbascum nigra – a lovely, large, lush, drought-tolerant plant. I started them from seed several years ago, and they’re now the sturdy bones of my largest bed. I leave the seed heads on for winter interest, but I’m thinking of taking them off this year because they’re so prolific. On the other hand, the young seedlings are fairly easy to pull out, so I may just leave the seed heads on and enjoy them. I love most all my self seeders. The favorite one right one is Larkspur. The book sounds like one I need to have! Self-sowers are a blessing. Right now I have a huge clump of fall blooming Anemones and Goldenrod ready to burst out of their seams. All of the above and add larkspur and annual candytuft to the list. Love the spreaders! Favorite self sowers are columbine, milkweed and rudbeckia. Usually sold as perennials but I love finding volunteers in new spots. This book sounds like my kind of gardening though I am in a warmer climate (MD). Thank you, Kathy, for writing about this book. I can’t wait to get it. Now I no longer feel guilty about not spreading ornamental mulch like my neighbors do. I love to see what will appear in my unmulched garden! I think I could learn to love this method of gardening. Self sown morning glories and columbine, just do as they please here. 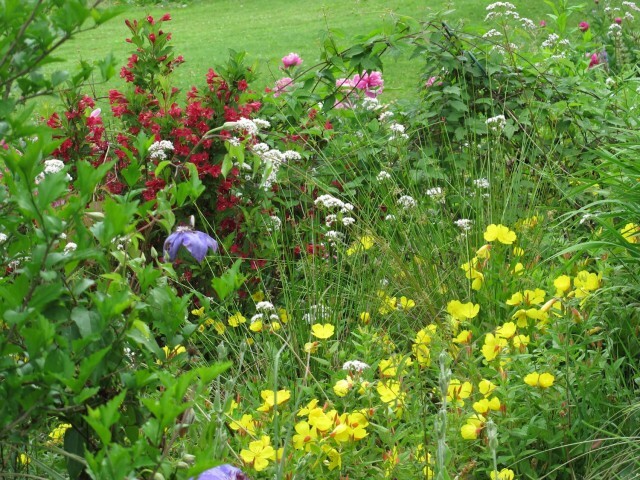 More welcomed in my gardens are self sown four o’clocks and hollyhocks. We have loved the Black-eyed Susans that self sowed from our neighbors yard, and are now showing up along our side yard, too! They are prolific and pretty here in northern virginia. This is the book for me…I have many self-sowers but would love to read about more and how to use them. My favorite is not an easy choice….I love echinacea, joe pye, forget-me-nots, heliopsis, helianthus, monarda, columbine..and so many more…they pop up, add color and whimsy to the garden besides filling in those gaps I hope to find after I finally weed…thanks for the giveaway. I already own a copy but I will say that this is a wonderful book. Original writing, great tips and an addition to have in your book collection. I like this idea. I have bought many flowers at farmers markets from people who have had to many self-sowers in their beds at home. I would love to win a copy of this book! 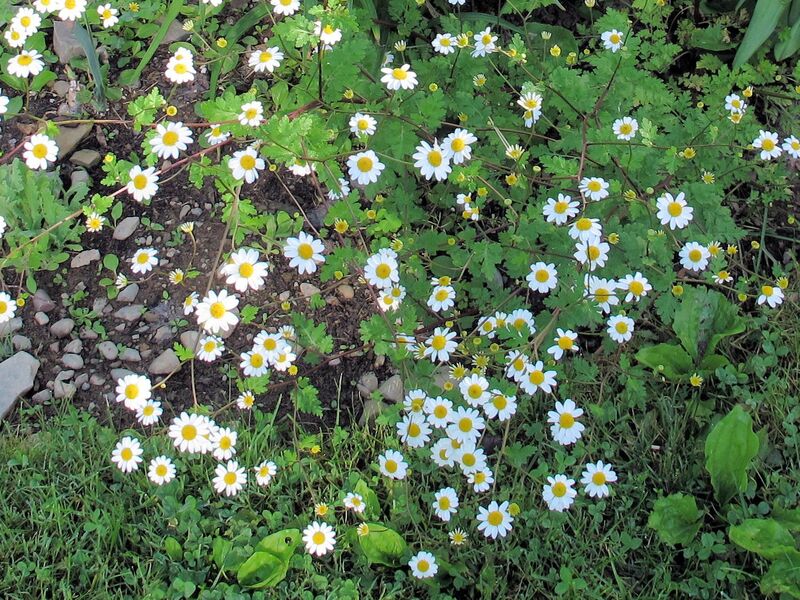 I’ve allowed some native “weeds” into a few of the perennial beds: in early spring blue mountain flower, then foxglove, various species of geraniums, jewelweed (Impatiens capensis), black eye’d Susan (Rudbeckia hirta), daisies, and others. In the lawn and meadow areas we’ve got self-heal, Indian paintbrush, milkweed, st. john’s wort, and more depending on time of year. I am interested in editing tips, and more easy going plants. The wildlife seems happy and other plantings don’t seem to mind these volunteers either! This book sounds like an insightful read. Filling in the gaps in your garden with self-sowing seeds is a great and easy way for a great looking garden, especially as they rarely take over over plants. Some great tips, thanks! This sounds like a great read with lots of helpful hints to make a beautiful garden. Love those plants that carry on without our interference. Having weeded, and planted so very much, I love this idea. I have planted a few of most plants mentioned above, but I want to fill areas that now are just weeds. There are people who don’t like self-sowers? But they’re free. I don’t understand.